A man who took pity on a cat he found lost and distressed in Liverpool has listed it on eBay in a last-ditch attempt to track down the owner. Steve Faragher, from Kensington, has been feeding and sheltering the black-and-white cat since finding her in Edge Lane last month. Although he has contacted local vets, police, RSPCA and lost cat websites, no one has come forward to claim her. "This is a last-ditch effort to find the owner," he told BBC News. Mr Faragher stumbled across the cat on 21 December last year as he was leaving work. "It was sitting outside crying its eyes out, then it started following me to my car and wouldn't shut up," he said. "I took it home for the night and a month later it's still there. "It is eating me out of house and home - I didn't realise cats ate so much." Mr Faragher believes the cat had not travelled far because her paws were not dirty or worn, while her coat was also in good condition. 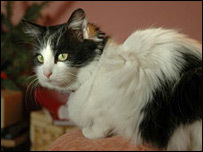 The cat was wearing a very distinctive collar which he believes the real owner would be able to identify. A number of cat-lovers have already offered to take his house guest if the owner does not come forward.